The AISWG offers various training and professional development opportunities. These are outlined below, but can be customised to meet the needs of most organisations. For information please contact either Heather (h.fraser@flinders.edu.au) or Nik (nik.taylor@flinders.edu.au. Please note these are generally not available to the public (our public events are listed under the events tab) and usually incur an honorarium that goes towards our work at the AISWG. We recognise many of our customers are NGO’s and so have a sliding scale of fees. Email us for more information. 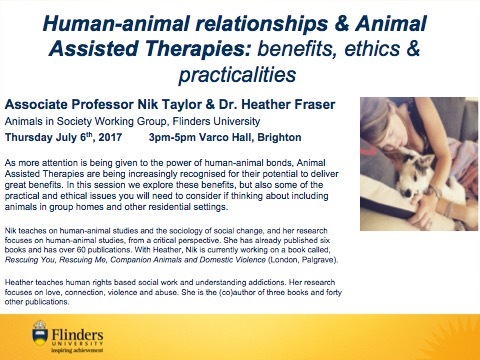 Minda, Human-Animal relationships and Animal Assisted Therapies: Benefits, ethics and practicalities. Centacare therapy staff: Cross-reporting between human and animal abuse (2015).